Born November 26, 1923 in Ottawa, Canada. Long time Irondequoit resident. Husband, Alfred, predeceased Elizabeth in 2011. Survived by her daughter, Ann Jones (David) of Steamboat Springs Colorado and son, Craig Larter (Anne) of Fairport NY. Betty is also survived by three grandchildren and two great grandchildren. 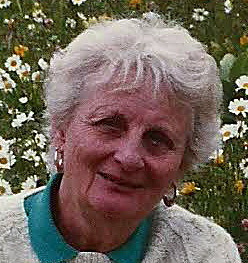 Betty enjoyed gardening, golf, knitting, cooking, rug hooking and travel. Betty was an accomplished artist. She attended Webster High School and RIT where she majored in fine arts. Betty worked many years in the display department at Sibley's. She also worked at Cooks World with Alfred which they owned for many years. Betty enjoyed the quiet peacefulness of Durand Eastman Park and took daily walks with family and friends. A Funeral Service will be held Wednesday, Jan. 30th, 1 PM at Crawford Funeral Home, 495 North Winton Rd. Interment at Irondequoit Cemetery. In lieu of flowers, contributions may be made to St. Mark's & St. John's Episcopal Church, 1245 Culver Rd, Rochester, NY 14609 or the Alzheimer's Association 435 East Henrietta Road, Rochester, NY, 14620.